ALL NEW REDESIGN!! LT!! DOUBLE CAB!! 4WD!! 5.3L V8!! ALL START EDITION!! 8 INCH COLOR TOUCH SCREEN!! HARD TONNEAU COVER!! CHROME RUNNING BOARDS!! 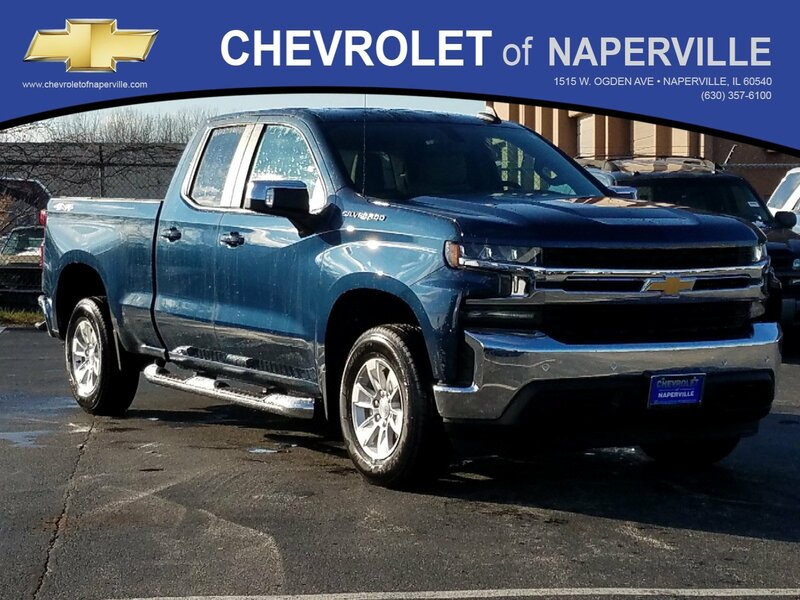 2019 CHEVROLET SILVERADO 4WD LT DOUBLE CAB, NORTHSKY BLUE METALLIC ON DARK ATMOSPHERE GRAY HEATED SEATING, 5.3L ECOTEC3 V8 ENGINE UNDER THE HOOD, 8-SPD AUTOMATIC TRANSMISSION, ADVANCED TRAILERING PACKAGE: HITCH GUIDANCE WITH HITCH VIEW, ADVANCED TRAILERING SYSTEM, AND TRAILER TIRE PRESSURE MONITOR SYSTEM, 22 HWY MPG!! LETS GO OVER ALL THE OPTIONS ON THIS AMERICAN WORKHORSE!! ALL STAR EDITION INCLUDES: DUAL-ZONE CLIMATE CONTROL, 10-WAY POWER DRIVER SEAT, HEATED FRONT SEATING, HEATED STEERING WHEEL, MANUAL TILT AND TELESCOPIC STEERING WHEEL, REAR-WINDOW DEFOGGER, 12 VOLT POWER OUTLET, KEYLESS OPEN AND START, THEFT-DETERRENT SYSTEM, LED DURABED LIGHTING, AUTO LOCKING REAR DIFFERENTIAL, TRAILERING PACKAGE, CONVENIENCE PACKAGE II INCLUDES: UNIVERSAL HOME REMOTE FOR GARAGE, POWER SLIDING REAR WINDOW, 120 VOLT POWER OUTLET, 120 VOLT DURABED POWER OUTLET, 8 INCH COLOR TOUCH SCREEN WITH VOICE RECOGNITION, 2 USB PORTS, HD RADIO AND HD REAR VISION CAMERA…YOU WANT MORE….WE GOT MORE!! TRI-FOLD HARD TONNEAU COVER, CHROME RUNNING BOARDS, 17 INCH BRIGHT SILVER PAINTED ALUMINUM WHEELS, ALL WEATHER FLOOR LINERS, SAFETY PACKAGE I INCLUDES: FRONT AND REAR PARK ASSIST, LANE CHANGE ALERT WITH SIDE BLIND ZONE ALERT, AND REAR CROSS TRAFFIC ALERT, LADIES AND GENTS THIS SILVERADO IS LOADED UP AND LOOKING TO GO TO WORK FOR YOU!! NOW HOW ABOUT SOME CHEVY WARRANTY….YOU GET A FULL 36 MONTH OR 36,000 MILE BUMPER TO BUMPER COVERAGE GOOD FROM THE DAY YOU TAKE DELIVERY, PLUS 5 YEAR OR 60,000 MILE POWERTRAIN COVERAGE!! ALL AT NO ADDITIONAL COST TO YOU!! 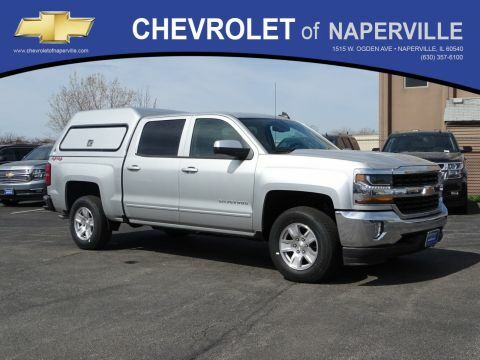 ONLY THING LEFT FOR YOU TO DO IS COME ON DOWN AND TAKE THIS LOADED UP SILVERADO FOR A SPIN AROUND OUR WORLD FAMOUS CHEVROLET OF NAPERVILLE TEST TRACK!! YEP…OUR OWN TRACK!! FIRST ONE HERE WINS…SEE YA SOON…FIND NEW ROADS HERE AT CHEVROLET OF NAPERVILLE!! Price includes all rebates in lieu of special financing their may be other rebates that you qualify for. Please call $2,000 – Silverado 1500 w/PDU/PEB Incremental Consumer Cash. Exp. 05/31/2019, $2,000 – Chevrolet Conquest Purchase Private Offer. Exp. 04/30/2019 Must finance through General Motors Finance. ALL NEW REDESIGN!! LT!! DOUBLE CAB!! 4WD!! 5.3L V8!! ALL START EDITION!! 8 INCH COLOR TOUCH SCREEN!! HARD TONNEAU COVER!! CHROME RUNNING BOARDS!! 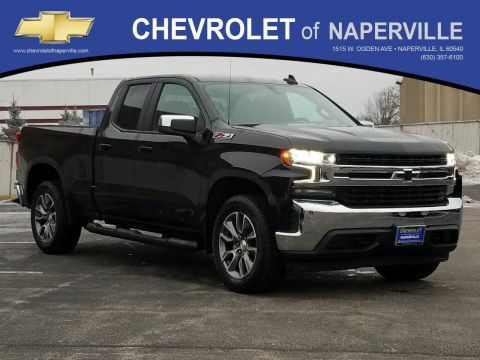 2019 CHEVROLET SILVERADO 4WD LT DOUBLE CAB, NORTHSKY BLUE METALLIC ON DARK ATMOSPHERE GRAY HEATED SEATING, 5.3L ECOTEC3 V8 ENGINE UNDER THE HOOD, 8-SPD AUTOMATIC TRANSMISSION, ADVANCED TRAILERING PACKAGE: HITCH GUIDANCE WITH HITCH VIEW, ADVANCED TRAILERING SYSTEM, AND TRAILER TIRE PRESSURE MONITOR SYSTEM, 22 HWY MPG!! LETS GO OVER ALL THE OPTIONS ON THIS AMERICAN WORKHORSE!! ALL STAR EDITION INCLUDES: DUAL-ZONE CLIMATE CONTROL, 10-WAY POWER DRIVER SEAT, HEATED FRONT SEATING, HEATED STEERING WHEEL, MANUAL TILT AND TELESCOPIC STEERING WHEEL, REAR-WINDOW DEFOGGER, 12 VOLT POWER OUTLET, KEYLESS OPEN AND START, THEFT-DETERRENT SYSTEM, LED DURABED LIGHTING, AUTO LOCKING REAR DIFFERENTIAL, TRAILERING PACKAGE, CONVENIENCE PACKAGE II INCLUDES: UNIVERSAL HOME REMOTE FOR GARAGE, POWER SLIDING REAR WINDOW, 120 VOLT POWER OUTLET, 120 VOLT DURABED POWER OUTLET, 8 INCH COLOR TOUCH SCREEN WITH VOICE RECOGNITION, 2 USB PORTS, HD RADIO AND HD REAR VISION CAMERA...YOU WANT MORE....WE GOT MORE!! TRI-FOLD HARD TONNEAU COVER, CHROME RUNNING BOARDS, 17 INCH BRIGHT SILVER PAINTED ALUMINUM WHEELS, ALL WEATHER FLOOR LINERS, SAFETY PACKAGE I INCLUDES: FRONT AND REAR PARK ASSIST, LANE CHANGE ALERT WITH SIDE BLIND ZONE ALERT, AND REAR CROSS TRAFFIC ALERT, LADIES AND GENTS THIS SILVERADO IS LOADED UP AND LOOKING TO GO TO WORK FOR YOU!! NOW HOW ABOUT SOME CHEVY WARRANTY....YOU GET A FULL 36 MONTH OR 36,000 MILE BUMPER TO BUMPER COVERAGE GOOD FROM THE DAY YOU TAKE DELIVERY, PLUS 5 YEAR OR 60,000 MILE POWERTRAIN COVERAGE!! ALL AT NO ADDITIONAL COST TO YOU!! 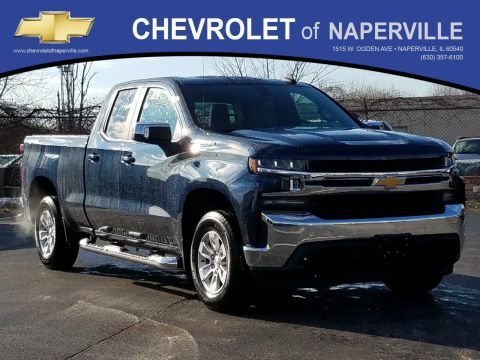 ONLY THING LEFT FOR YOU TO DO IS COME ON DOWN AND TAKE THIS LOADED UP SILVERADO FOR A SPIN AROUND OUR WORLD FAMOUS CHEVROLET OF NAPERVILLE TEST TRACK!! YEP...OUR OWN TRACK!! FIRST ONE HERE WINS...SEE YA SOON...FIND NEW ROADS HERE AT CHEVROLET OF NAPERVILLE!! Price includes all rebates in lieu of special financing their may be other rebates that you qualify for. Please call $2,000 - Silverado 1500 w/PDU/PEB Incremental Consumer Cash. Exp. 05/31/2019, $2,000 - Chevrolet Conquest Purchase Private Offer. Exp. 04/30/2019 Must finance through General Motors Finance.